← Ooooo, you mean I have to turn things in for a grade? School is kinda like riding a bike — it all comes rushing back even though those first few moments are a little harrowing. I encountered my first “quiz” last week. It popped up in my English class. The readings in the class focus on culture (shorthand for race issues, apparently, more on that later) and I had definitely read the material and felt confident. But wow. I needed to remember THAT? I certainly had not MEMORIZED the text. But now I get it…it’s important to remember the intent of the author as well as the evidence presented in their work. I’m taking it easy on myself, though. It has been about 13 years since I have been quizzed on anything other than salsa choreography, you know? And especially since most classes omit my least perfect work when calculating my final grade, I’m doing my best, but letting this roll off my back. Learning the material is like riding a bike, too. 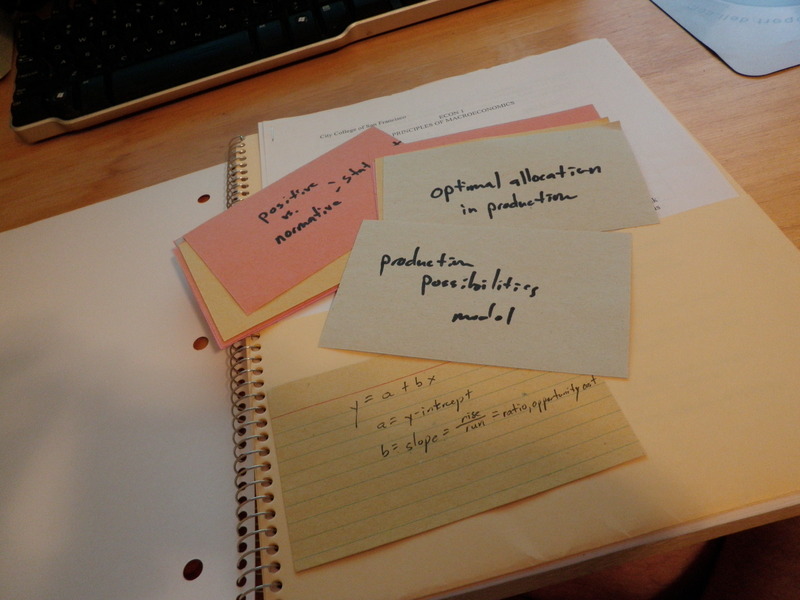 I rediscovered FLASHCARDS! the other night when studying for macroeconomics class (macro). Since it’s my first time studying it, there are a lot of terms and concepts to remember. I was perhaps a bit overly excited to break open that pack of index cards I have hoarded on my shelf for a year! I’m a cheap date like that. Class discussions, though — they’re just like working in a non-profit. Challenging in nearly the same ways for me. Everyone has something to say and has to process everything. People talk out of turn, people talk for too long to get a point across, people talk without raising their hands, and usually the loudest are … the least skilled. My apologies for the silence from my camp this week. I’ve been adjusting. Week 3 draws to a close today! I have to give a shout-out to my sister and brother-in-law, Kristy and Gerald, for getting me this great new camera for Christmas! I take it with me everywhere and snap pictures all the time for you guys. It’s an Olympus Stylus TOUGH-6000, if anyone is curious what I’m using. Alright, I’m off to take a computer class test and do an acting exercise! It’s time for The Interview. I chose my neighbor across the street, who starts up his Suzuki sportbike every morning at 845 and returns every evening at 515. Ha! I’m loving the vicarious academic experience! Please don’t bail on your loyal readers after midterms! yay! I’m so happy you are adjusting well to the rigors of academia!! I have an olympus stylus that is a couple yrs old, and that is what i take with me on all my adventures in the mountains!! It’s a great camera because it’s waterproof ( I have literally taken pictures underwater in the ocean) and it’s shatterproof( in the event you drop it).